Pesach, known as Passover in English, is a major Jewish spring festival, commemorating the Exodus from Egypt over 3,000 years ago. The ritual observance of this holiday centers around a special home service called the seder (meaning “order”) and a festive meal; the prohibition of chametz (leaven); and the eating of matzah (an unleavened bread). On the fifteenth day of Nisan in the Hebrew calendar, Jews gather with family and friends in the evening to read from a book called the hagaddah, meaning “telling,” which contains the order of prayers, rituals, readings and songs for the Passover seder. Today, the holiday is a celebration of freedom and family. 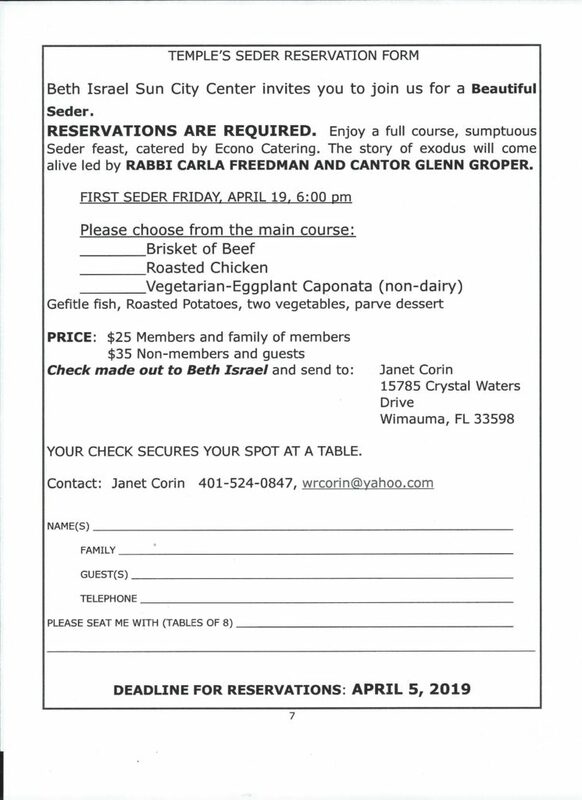 The first Seder will be Friday night April 19, 2019. The holiday of Pesach (Passover) is in less than four weeks. The first Seder will be celebrated Friday night, April 19. The second Seder (in the Diaspora only) will be celebrated, Saturday night, April 20. Our sages tell us that thirty days before the holiday of Pesach we have to begin studying the laws of Pesach. There are many laws and customs associated with the Pesach holiday. We should be prepared for the holiday properly. The Pesach Seder shouldn’t only be an excuse for another delicious meal. It must also have a religious flavor too. It is a time when we celebrate not only our physical freedom, but also our spiritual freedom. Our children and grandchildren deserve to benefit from the spiritual beauty of the Seder. Just like the food needs preparing, so too, to make the Seder meaningful needs preparation. The prohibition of chametz (leavened foods such as bread, cakes, alcohol beverages etc.) during Pesach is very strict. Thus, it is very important to make sure that all products purchased for Pesach should have a reliable kosher certificate. Chag Ha-Aviv – The holiday of spring. Chag Ha-Matzot – The holiday of matzot. Chag Ha-Pesach – The holiday of Pesach (Passover). Z’man Cheiruteinu – The season of our freedom. Pesach is Chag Ha-Aviv – The holiday of spring. This is the reason why we have an extra month (leap year) every few years (like this year) in the Hebrew calendar. to make sure that Pesach is celebrated in the spring. Without the extra month Pesach would have been this year in the winter. Q. The Torah usually refers to the holiday as “Chag Ha-Matzot” – holiday of matzot. We, on the other hand, call the holiday “Chag Ha-Pesach” – holiday of Passover. Why is this so? A. Rabbi Levi Yitzchak of Barditchev explains it this way. We call the holiday Pesach, which means to Pass-over – thus we give praise to G-d for sparing the Jewish people by passing over their homes when He afflicted the Egyptians. G-d, on the other hand, calls the holiday Chag Ha-Matzot; with this name He gives praise to the Jewish people, for the trust they had in G-d, leaving Egypt in haste, without even preparing food for their journey. They only took out their raw dough which the sun baked into matzot. This shows their great faith in G-d that He would provide for all their needs in the desert, as G-d indeed did. It may surprise many, but the prohibition of eating “chametz” – leavened foods on Pesach, is stricter than eating pork! It doesn’t make the prohibition of pork any lighter, G-d forbid, but it gives us an idea how strict the laws of Pesach are. One must be especially careful with alcoholic beverages, as most are NOT kosher for Pesach, unless it has a valid certification from a reliable source. Beverages made from grains (beer, vodka, scotch, rye, etc.) are NOT kosher for Pesach. Q. We have a meal every Shabbat and every holiday. Why is the meal we eat Pesach night different than all other meals of a whole year.. that it is called Seder? Q. On Shabbat and holidays, we place two Challah on the table. We recite the Kiddush and then recite the blessing over the Challah. On Pesach we are prohibited from eating Challah, so we replace it with matzah. But for the Seder we place three matzot, instead of two every Shabbat. Why? A. When we recite the blessing over the Challah or matzah they should be whole. We slice it only after the blessing. But on Pesach, we break the middle matzah at the beginning of the Seder and hide half for the Afikoman. In order to have two whole matzot when we recite the Hamotzi blessing over the matzot later, we need the third matzah which is whole. This is one reason for the third matzah. We also need the third matzah for the matzah and maror sandwich, called Korach, which we eat at the Seder. Q. Eating matzah on Pesach is to remember the Exodus. Were the Jewish people coming out of Egypt the first to be mentioned in the Torah to bake matzah? A. No. Abraham’s nephew, Lot, who lived 400 years before the Exodus, is the first one mentioned in the Torah to bake matzot. It is mentioned that he served the angels who came to his home, when they came to destroy the cities of Sodom and Gomorrah (Genesis 19:3). That story happened on the same day which, 400 years later, became the Passover holiday. Q. We always wash our hands before eating bread. Yet, at the Seder we wash our hands twice. In addition to washing our hands before making the blessing over the matzah, we also wash our hands before dipping the vegetable into the salt-water. Why? A. It is also customary to wash our hands when we eat something which we dip into liquid. However, we wash without a blessing over the washing. Thus, before dipping into the salt-water we wash.
Q. How old was Moshe when G-d sent him to command Pharaoh to let the Jewish people free? A. Moshe was 80 and Aaron was 83. Q. How many people left Egypt at the time of the Exodus? A. 600,000 men (over the age of 20). In addition, there were women, children, and a multitude of people from other nations that left with them. A few million people left Egypt at the Exodus. Q. Did all the Jews who were enslaved in Egypt leave at the time of the Exodus? A. No. Only one fifth came out, the other four fifths didn’t want to leave. G-d punished them and they died during the plague of darkness. Also, 200,000 people of the tribe of Ephraim escaped thirty years before the Exodus and were killed by the people of Gat. The Passover (Pesach) holiday begins Monday night, April 10. In Israel Pesach is celebrated 7 days. In the Diaspora, it is celebrated 8 days. In Israel only one Seder is performed. In the Diaspora, two Sedarim are performed. The first Seder is Monday night and the second Seder, Tuesday night. The difference between Israel and the Diaspora, goes back two thousand years. In Israel, where the High Court (Sanhederin) was situated, they knew the exact day when the new month (Rosh Chodesh) began, thus they knew when the holidays begin. In the Diaspora, where the news took long to reach, they didn’t know in time when Rosh Chodesh was, so they observed an extra day holiday and performed a second Seder. The Seder traditions and costums date back thousands of years. The Pesach Seder is our link with our glorious history. Should one of our ancestors drop in on us at the Seder, they would feel very much at home and would participate in our Seder just as they did in theirs in ancient times. At the beginning of the Seder, after the Kiddush, the one who leads the Seder breaks the middle matzah in two. The larger piece is wrapped in a cloth or napkin and hidden so it can be eaten later at the end of the meal. This piece of matzah is called “Afikoman.” The smaller matzah is placed back between the two whole matzot, and is left there during the recitation of the Hagadah. Q. What is the significance of the three matzot on the Seder Plate? A. 1) They represent the three categories of the Jewish people; Kohen, Levi and Yisrael. 2) They also represent the three patriarchs; Abraham, Isaac and Jacob. Q. Why do we break the middle matzah? A. The Torah refers to matzah as “Lechem oni” – “bread of poverty.” A poor man when he has a loaf of bread will always think about the next meal. He fears that he may not have anything to eat later, so before he eats his meal he usually breaks off a piece and saves it for later. Thus, we leave the smaller piece on the table and recite the story of the Exodus over it – representing the bread of poverty which the Jewish people ate in Egypt. Q. What is the reason for “wrapping” the Afikoman and “hiding” it? Q. On Shabbat and holidays, after reciting the blessing over the first cup of wine (Kiddush), we can drink as many cups of wine as we want, without reciting another blessing over each cup. Yet, at the Seder we drink four cups of wine and we recite the blessing over wine before each cup. Why? A. The reason we drink four cups at the Seder is to commemorate the four expressions of redemption which G-d used for the Exodus. Each cup represents a different expression of redemption and thus is a separate mitzvah. Because they are four separate mitzvot, we make a separate blessing before drinking each cup. Q. At the Seder, when we perform the mitzvah of eating the matzah and drinking the four cups of wine, we are required to sit in a reclining position. What is the reason for this? A. In ancient times, noblemen would eat in a reclining position. It was a sign of freedom. The average person, especially a servant, did not recline. At the Seder, when we celebrate our freedom from slavery, the rabbis instituted that we demonstrate our freedom by reclining as noblemen when performing the special mitzvot at the Seder. Q. Why do we recline on the left side, not on the right side? A. Our sages established that we recline on the left side so that the food should not accidentally enter the upper part of the windpipe, which may cause choking. Q. Why, when eating the maror (bitter herbs), we do not recline? A. The maror is to remember the bitter slavery we endured in Egypt. It is not a sign of freedom. Q. What is the reason for filling the “Cup of Eliyahu (Elijah)” at the Seder? A. The four cups which we drink at the Seder commemorate our past redemption. The “Cup of Eliyahu” symbolizes our future and ultimate redemption with the coming of Moshiach. According to tradition, Eliyahu HaNavi (Elijah the prophet) will be the one to inform us of Moshiach’s arrival. May it occur speedily in our days!